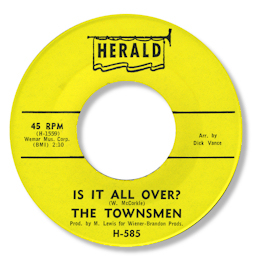 Like so many groups there were several sets of “Townsmen” but the combo I’m writing about here were the group with joint lead singers Bill Witt and Ernest Stevens who came from New York. Witt had a pedigree in the doo wop scene, singing with the Rocketones and, briefly, the famous Paragons but the other guys including Stevens – Robert Stewart (bass), William “Bubba” Moore (tenor) and Brother “Bossy” McKinney (baritone) – are unfamiliar to me. I think that this group only had three releases but I am happy to be corrected on this. Their “You’re Having The Last Dance With Me” has charm and a fun initial spoken intro but it really is much too close to the Drifters original to be worth seeking out. Much better is their Columbia 45. 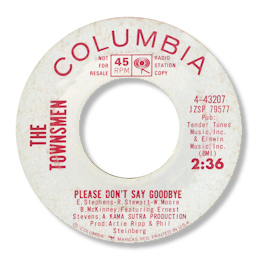 Please Don’t Say Goodbye is an uptown ballad with a similar feel to Eddie Jones’ lovely “Let’s Stop Fooling Ourselves” and some really impassioned lead singing from Stevens – who can just about be heard over the “kitchen sink” production from Artie Ripp and Phil Steinberg. But their outstanding cut is the deep Is It All Over. This is pretty much a perfect blend of doo wop, R & B and gospel quartet singing. The harmonies are spot on and Stevens comes across like a man possessed. Superb “early soul” style accompaniment too. Note that Leo McCorkle is the writer. Witt went back to the Paragons in the mid-70s to tour on the oldies circuit.